Perusahaan Umum Percetakan Uang Republik Indonesia - Perum PERURI or most known as PERURI is the Money Printing Public Company of the Republic of Indonesia. PERURI is a state-owned banknote/security printers and mint company in Indonesia. PERURI has main business competencies to printing 5 flagship products, namely the Indonesian money (banknotes and coins), Indonesian passports, excise stamps, seals, and land certificate. 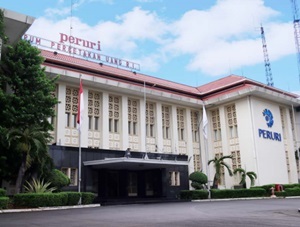 PERURI was established on 15 September 1971 as a merger results of 2 state mint companies; PN Artha Yasa and state printers PN Pertjetakan Kebajoran (PERKEBA). Perum PERURI is a non listed state-owned company and is fully-owned by the government of Indonesia which represented by the Minister of State-Owned Enterprises (SOE). Based in Jakarta, PERURI now has production facility in Karawang West Java. As of December 2016, PERURI supported by 4 subsidiaries, 1 operational cooperation (KSO) and 1 affiliated company namely PT Kertas Padalarang, PT Peruri Digital Security, PT Peruri Properti, PT Peruri Wira Timur, Peruri Divisi Barat and PT SICPA Peruri Securink (SPS) . In term of financial performance, PERURI produced satisfactory results in the 3rd quarter of 2017 (3Q17, ended in 30 September 2017). According to information found in PERURI Financial Report 3Q17 as cited by JobsCDC.com, PERURI registered total revenue of Rp2,259.59 billion in 3Q17. This number is up 45.32% year-on-year (YOY) as compared to Rp1,552.15 billion in 3Q16.PERURI managed to record a total profit of Rp 372.07 billion at the end of September 2017 or equal to an increase of around 180.7% compared to Rp132.52 billion in the previous year. D3 in any field (preferably from Office Administration). SMA: Mathematics, Physics, Chemistry, and English at least 60 on a scale of 100. D3: Minimum GPA of 2.75 from Scale 4.00. SMK Graphic, Automation Engineering, Electricity Engineering, Industrial Electronics, Mechatronics Engineering, Production Mechanical Engineering. D3 Graphic, Mechanical Engineering, Electrical Engineering. SMA: Mathematics, English, and 2 main subjects according to expertise of at least 60 on a scale of 100. D3 Secretary, Business Administration, Business Administration, Office Administration, Management, Communication and Public Relations. Minimum age of 18 years and maximum age of 26 years old. Minimum accreditation B for SMA / SMK and minimum accreditation C for D3. Never and / or is not undergoing a court process and is involved in a legal case. Not involved as a member of a political party or a banned organization. Willing to be placed in Jakarta and Karawang. JobsCDC.com now available on android device. Download now on Google Play here. Please be aware of recruitment fraud. The entire stage of this selection process is free of charge. Perum PERURI - SMA, SMK, S1 Fresh Graduate PKWT PERURI February 2019 will never ask for fees or upfront payments for any purposes during the recruitment process such as transportation and accommodation.